The new Seagate Expansion 1TB external hard drive is a fast and cost efficient drive that will easily fit into one’s purse or jacket pocket. A top capacity 2TB is available at extra cost and is also available in a 500GB version. There is also a legacy version of the Seagate Portable Expansion hard drive; the two versions of the drive are much the same. The Seagate expansion portable 1 TB hard drive is a basic storage device that comes with no backup software or any included encryption support. It has a short warranty of only one year where most portable drives have a minimum of two years warranty or more. If you need large storage space and a very fast performance, the Seagate Expansion portable 1 TB hard drive is a superb way to get more storage for your computer or device. The simple design of the drive is very good for game consoles or media players. The Seagate Expansion portable 1TB external hard drive only measures 4.8 inches by 3.2 inches by 0.6 inches. This makes the external hard drive very easy to carry about you. It is tiny enough to fit in a lady’s purse or a man’s trouser or jacket pocket. It is also robust and will easily survive most small falls and bumps which means, your data will remain safe. Inside the Seagate Expansion 1TB hard drive is an energy efficient device that spins at a slow 5,400 rotations per minute, and not the usual 7,200rpm found on most hard drives. The slower spin speed does not translate into slower performance, but instead means lower power consumption without loss of some performance. The Seagate Expansion1TB Hard Drive comes in a carton and includes a twelve inch long 3.0 Micro USB cable. There is no instruction leaflet. This is all that is required to get you up and running the moment you open the box. Just like all other portable drives, the Seagate Expansion is bus-powered, needing only one cable for data and power. The moment you connect, you should see the extra drive appear on your computer. Then it is a simple matter of dragging and dropping files into the new external drive folder. There is no requirement for any additional software. When you open the box you’ll find your Seagate expansion Hard Drive is factory formatted to the NTFS file system so it works right away with any Windows computer including the new Windows 10 operating system. If you have a Mac computer, you can easily reformat it to HFS+ in just a few seconds. Generally speaking, this type of external hard drive is much cheaper means of storage than a Mac dedicated hard drive. It is even possible to use the hard drive in a mixed Windows and Mac environment; you can do this by reformatting using the exFAT file system. Learn more about this best seller on amazon here. What is good about the Seagate Expansion Portable 1 TB External Hard Drive is it quickly copies files and offers a large amount of storage for the price. The device is very compact, stylish, fast and will fit easily into most people’s pockets, handbags and purses. The portable drive is very easy to use with game consoles and all PCs including Macs. Things you should be aware of before you buy it. There is no backup software provided on the device and has no included security features which one might expect. In addition to this it has only a one year warranty where most hard drives have two years warranty plus. However, the Seagate expansion portable hard drive provides one TB of storage, in a quality device and for a modest price. 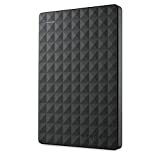 If you are on a budget this is a good quality large capacity external hard drive for the price. The Seagate expansion 1 TB hard Drive is a cheap no frills hard drive, compact, well made to a high standard of quality. It is extremely portable and can be carried in a purse, handbag or pocket. It will work well with other popular devices, such as game consoles or media players. However, do make sure you first format it into the supported file system for the intended device. It works well with the Xbox One. When plugged in the drive was quickly recognized and it could be used to save games and apps, as well as to store media for later playback. All, in all, a good quality no frills external hard drive at an affordable price for people who need a lot of extra storage capacity. Click here to see more information about the seagate 1tb External hd.